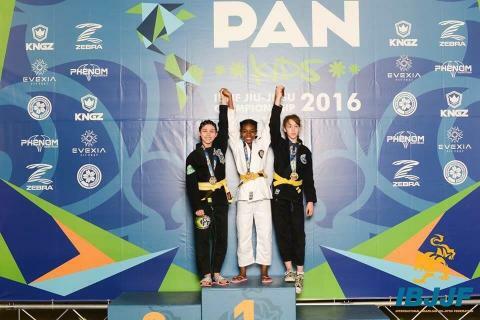 A talented youngster from Beckenham, Nia Blackman took home gold this weekend at the IBJJF Kids Pan Ams competition, the biggest junior BJJ (Brazilian Jiu Jitsu) tournament for juniors in the world. 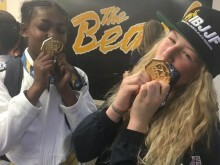 On Valentine's Day in the Walter Pyramid in Long Beach California, Nia, who is one of the top junior yellow belts in the sport in the UKBJJA rankings and trains at New School BJJ in Battesea, saw off the opposition in style to claim the title. Not intimidated by competing on the big stage, Nia rose to the challenge of facing the best athletes in the sport from gyms from across the globe. Her first fight was against last year's Pan Ams champion, yet her calm focused demeanour and technical game ensured victory. In fact in both fights, Nia didn't concede a single point against two extremely strong opponents. The youngster's commitment to achieve her goals is evident from the way she prepared for the competition. 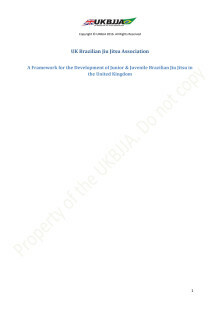 Nia did 6.30 am strength and conditioning gym sessions, 3-4 times a week through her Mytime Leisure Sporting Champions scheme award, which provides free entry for Top Athletes in all its centres in the Bromley Borough and for which the UKBJJA wrote a letter of support. Then it's home, a quick change, and school, after which Nia sits down to do her homework, have her tea and then head off for BJJ training in the evening from 6.30pm until 9pm. The Blackman family enjoying Nia and Zuri's success. Aside from her own hard work, the support of family, coaches and friends is part of the reason why Nia is so successful. 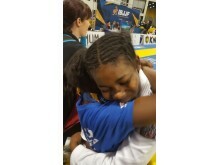 It's not just Nia who trains but her little sister Zuri, who also competes and won bronze at the Pan Ams, and a mat side embrace between the two girls after Nia's win summed up the bond between these two dedicated young athletes. 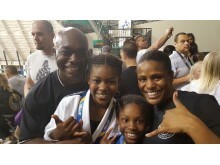 Nia and Zuri's mum Sherise who travelled out to California with her daughters said "I'm incredibly proud of their hard work and dedication to BJJ. Yet they maintain top sets in all subjects at Langley Park School for Girls. As parents we couldn't ask for more! It's inspiring for someone so young to be this focused and committed." Nia and Zuri embrace after the older sister wins the gold. When not with her sister, Nia is often to be found in the company of her great friend and fellow BJJ Pan Ams champion Dali Hopkins. Fierce opponents on the mat, the two girls are equally firm friends off it and drilled together in the California sun before the competition to help each other prepare. Both came away with golds this weekend in their divisions so there was much to celebrate. The 11-year old said, "I had so much fun at the Pan Ams, it's great to fight new people and test out all the things I learned in training. Plus my lil sister Zuri and BJJ buddies Dali and Reyce were with me too so it was extra awesome." Friends and gold medallists Nia and Dali celebrate their wins. Nia and Zuri did their team and the UK BJJ scene proud, and coach and black belt Antony Chahal commented. "We are extremely proud of Nia and Zuri, not just for their results but their constant attitude and dedication to Jiu Jitsu. Both girls are so talented, and combined with their hard work, this will no doubt lead to success. Experiences such as competing at this high level are invaluable and we'd like to thank all of our students and friends who helped support the family." Proud coach Antony Chahal from New School BJJ with his student. The BJJ star clearly relishes every minute she spends training and competing. 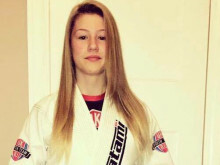 Nia said, "I love Jiu Jitsu because I get to meet loads of people from all over the world. I've now trained at BJJ clubs in Japan, Florida and Los Angeles, it's fun to learn new techniques and getting to compete. I want to be a black belt and travel the world training Jiu Jitsu. I'm so grateful to my Mum and Dad and to my coaches I'm very lucky, me and my sister get a lot of support." No doubt the future holds great things for this talented young athlete.